During the first three parts of this series I have explained some of the ups and downs of going on this G Adventures small group tour in a remote area where you are essentially 100% dependent on your tour company, your guides and your fellow travelers (and tourists). But even with imperfections some truly remarkable and otherwise impossible experiences are possible. The first one is to keep things in perspective. Put into play here: I AM IN THE AMAZON! HOW COOL IS THAT! Clearly my focus changed from "Ugh" to "OMG!" The second thing I do is make sure that their loss is not my problem. On this trip I was truly shocked that some of my fellow passengers were technically well-traveled, but actually were tourists that focus on getting good deals to exotic places so they can say they were there. I didn't hear one of them tell a story about when they were someplace; only that they were there. Ironically, the first thing that jumped into my mind was the long, and usually humorously, debated, "Is cruising really travel?" which I now must expand and restate! in one of his gill nets on a creek. Creek banks literally lined from one end to the other with gill nets, and then the occasional gill net strung across the creeks. Those nets trap anything that is big enough to have its gills caught up in the netting. That got me thinking about the ecology and pressure on various types of fish; if any of the fish were merely discarded as "junk"; if these fisherman were truly fishing for the "locals" or if there is a "mother ship" they are actually working for; how much of the fish is eaten fresh or is salt cured; what effect this sort of fishing has on bird and other wildlife, etc. While the guide didn't give me the answers...or even raise the questions...my "travels" have got me thinking and researching this topic of interest to me. while some in my group waited...to pose with a baby sloth. It was interesting walking through was clearly was a "show" school with concrete sidewalks (in the Amazon...really?!) and pristine-ish classrooms. While there was a "pitch" for us to provide pens, notebooks, etc. I didn't notice any. In fact, I didn't see a single book anywhere. It got me thinking about not how long children in the Amazon go to school, but what do they actually do in school and what do that do afterwards as there is literally no sign of industry (save rudimentary fishing, rice crops and the horrific slash and burn charcoal production). and, honestly, the beauty of the colors flying overhead will remain an inspirational memory of mine far longer than than those later while sitting underneath some other macaws...and that was pretty special. There are alternatives at varying price points that provide you with very similar itineraries. For example, Aqua has a true luxury cruise with high tech skiffs, gourmet cuisine and a gorgeous ship. Prices start at $6,650 per person (more than 2.5 times the cost of the G Adventures trip). In between the two is International Expeditions, with prices starting at $4,398 per person. You can compare the Aqua Itinerary with the G Adventures Itinerary and International Expeditions Itinerary and determine if the improved or significantly improved amenities are worth the price difference. For some they will definitely be...and, in fact, may be the only real option. For others, not so much. But remember, I have been to the Amazon on both a river cruise and a land tour. For me a land tour gives you far more opportunities and allows you to have an experience that is greater in depth..but some of it is quite rustic. International Expeditions offers a 14 day land itinerary that does a good job of balancing the "get out there" with a respite of modern amenities. That also helped with my keeping perspective as rarely does a cruise provide the same amount of time (or quiet) to explore. While it is my job to really analyze any trip I am on and ask if it delivers for me and if it will for my clients, I do not lose sight of the fact that being in the Amazon is - with all of the compromises that need to be made - so well worth it. This was my second trip there and I know that there will be a third one. It will be longer (as a week just isn't enough for me). Comments? Please post them on The Gold Standard Luxury Travel Forum. 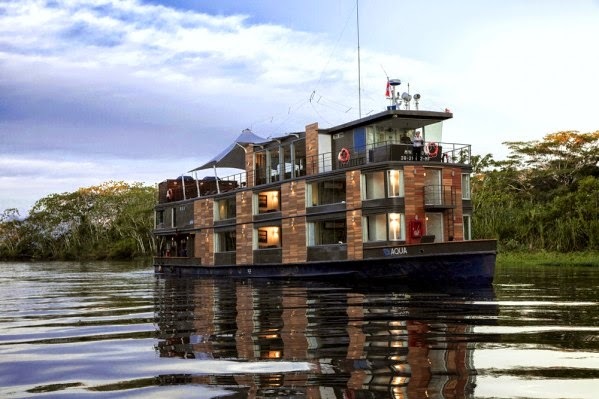 If you are interested in visiting the Amazon, please give me a call at (877) 2GO-LUXURY or +1 732-578-8585 or email me at eric@goldringtravel.com.